MULTICAM CNC Routing Systems will be exhibiting and demonstrating the latest generation of the Multicam Series of CNC flat bed routing machines. Multicam CNC machines are designed for cutting sheet products and extrusions including metals, plastics, composite materials, and timber products. Multicam machines are rigidly constructed and incorporate an advanced controller optimised for ease of use and speed of operation. Low operating costs combined with minimal servicing requirements means that the Multicam is a viable alternative to Plasma and Laser machines with much higher running costs and demanding greater servicing. Process areas ranging from 2400x1200mm, 3100x1800mm and up and can be supplied with your choice of either T- slot or vacuum hold down. A range of high precision ceramic bearing HSD spindles or Perske spindles can also be supplied. Spindle types include collet type to quick change ISO30 ER32 holders. All machines can also incorporate a fully automatic tool changer to further increase machine versatility. Integrating with a standard PC, the Multicam ToolPath software is a Windows-based program that will accept files from all major CAD/CAM packages. Toolpath will quickly and automatically process your drawing file for the Multicam machine to run. Quick programming of cut sequences and directions, tool changes and material TAB's (all features designed to make cutting metals, plastics and timbers easy and efficient) means that productivity is maintained through the entire manufacturing process. 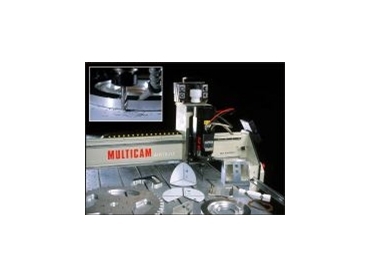 Multicam Systems has been supplying CNC routing machinery to industry for over 14 years and will be happy to demonstrate the abilities of the Multicam CNC machine at Stand D30 and talk about how this machine can benefit your business.